Dice of the First Degree: Kromac2 vs. Doomshaper3. It's apparently my favorite matchup. Kromac2 vs. Doomshaper3. It's apparently my favorite matchup. I've played several games with Doomshaper3. Five of those have been into Circle, three of those into Kromac2 specifically. Kromac2 is not the preferable matchup. Lately, I've been dropping Grim2 or Doomy3, and against my opponent's Krueger2 or Kromac2, I dropped Doomy3 again and he brought Kromac2. Again, I've played this matchup a few times. Most of my Doomshaper3 games, actually. 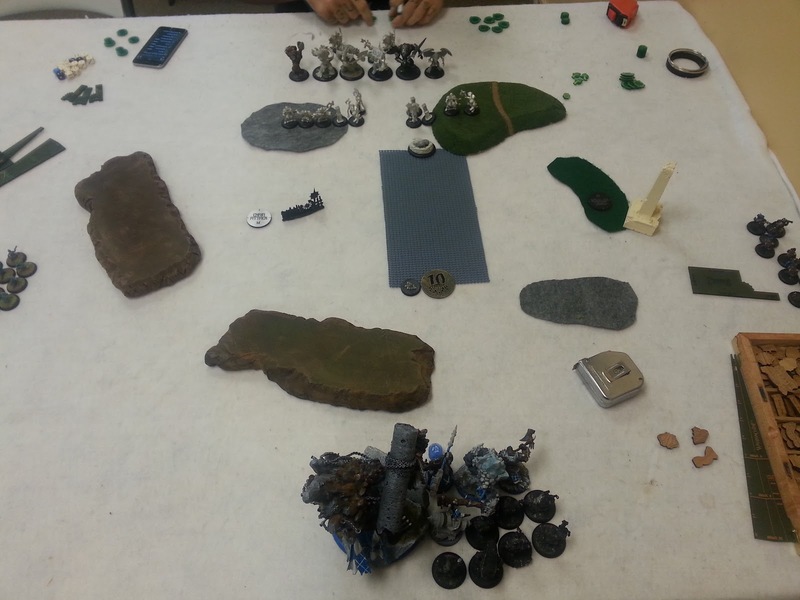 I played it Thursday against a friend, and we played over Destruction. Because I forgot my Mountain King, I played out of tier with Rok and Lanyssa. A rushed Rok charging a Hunter's marked Ghetorix goes a long way. On my feat turn Rok killed Ghetorix and the objective, the Axer cleared a few things and Mulg killed the Gnarlhorn and the only gallows grove, then weathered Kromac2 on the next turn, admonitioning away from the Stalker with 14 boxes left. Doomshaper charged Kromac2, getting the crit smite and KD, and Mulg finished the game. It was also his first game with Kromac2 and he was still figuring out his list, though a Bounding Ghetorix is a major issue for me. I'm afraid next time he'll have a Blackclad for that sweet +4'' charge range on his favorite reach heavy. Mine is the same that I've played 90% of my games with Doomy3. I roll the rolloff, elected to go first. Scenario was Recon. The grey zones are "Tall Grass". It's apparently a thing. Provides concealment, but is not rough terrain. Burrowers burrow. Axer rushes Mulg, charges up. 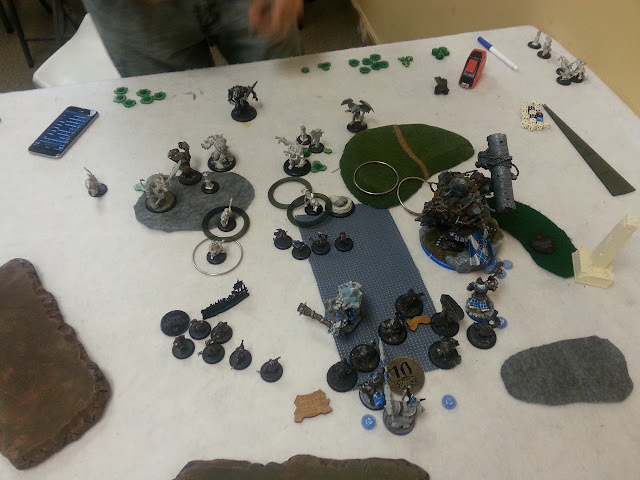 Mulg runs to the right of my objective. Doomshaper rushes Mountain King, casts Implacability, dumps the rest to the stone and charges forward. KSB runs and pops aura. Mt. King runs his full 16'' up the board. This almost costs me. He begins by pushing Ghetorix forward with the Stalker. The Druids move around and pop clouds, leaving a charge lane for Ghet. The stones port around into a large triangle. Kromac feats, getting up the board a bit and putting Awakened Spirit on Ghetorix. The right Blackclad charges a druid, kills it, casts Hunter's Mark at the King and falls short a good half inch, meaning that Ghetorix can't get there. We measure it for kicks and giggles, and even with Hunter's Mark, Ghetorix is just out even with a push from the Pureblood. Still, it almost got me. He also didn't deploy his blackclads on the line and hung them back a bit, which bit him. Anyways. Stuff mills about. Can't get to me this turn, and he doesn't want to lose much to me on my turn, so he hides Ghetorix behind druids and such along with his other beasts. I really want to kill Ghetorix. I really feel like if I don't kill a heavy on my feat, I'm losing the game. I have to trade the offensive aspect of the feat for something. Doomshaper moves to the zone by the objective, feats, and does Signs and Portents for infantry. Implacability goes up, and Admonition goes on Mulg. The Burrowers move up and try to shoot out just one blackclad, but needing boxcars, I roll 11 twice but can't get it done. Otherwise, I think I had range to Ghetorix with the King, but I just can't get there. Not enough room to trample even, and Mulg is on the wrong side. He probably had range to get to the Druid on the other side of the zone, and then goad over to clear a way for the King, but it seemed like a pretty ballsy maneuver that would lead Doomy wide open. So instead, Axer moves up, rushes the King. The King assaults right, kills a stone and blackclad with the Assault spray, kills the Druid and then kills the Druid UA with the Killshot. No teleporting at least. Druids pass CMD from Mountain King being terror causing. Mulg moves up. Ghetorix charges forward to the Burrowers on the left and kills one. They pass CMD. Pureblood sprays three Burrowers, but 2 tough. Stalker gets lightning strike onto Kromac. Kromac primal howls, kills one in front of him but it toughs, again. So he hits, toughs again. Third one kills it, leaving him on one transfer. 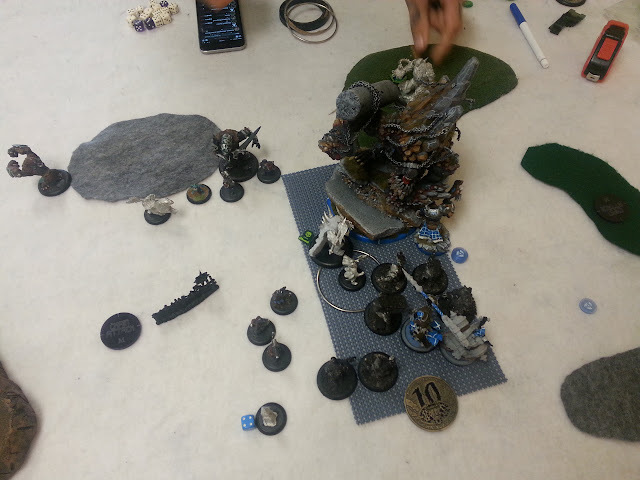 Burrowers pass CMD from both Kromac's terror, and casualties. He runs to the wall near Ghetorix. Druids move up and cloud, and the Rotterhorn goes into the zone. Stalker runs up a bit and toes into the concealment. Gorax does the same. Stones teleport to block lanes to Kromac and contest the zone somewhat. Pull in fury, leave one on axer but it passes frenzy check. My opponent isn't giving me any whelps. Doomshaper moves to the other side of the objective, did not upkeep admonition. Cast Implacability, and puts three or four to the stone. Does free animi this turn. Stones pop aura and do +1 STR. Burrowers move up and do tarpit things but nothing hits. Mountain King steps into the group of Circle models and sweeps with a free Amuck. He kills the objective in one attack, the druid and hurts the bird. I buy an attack on the stone keeper and boost the hit, killing him. The killshot spray goes into Kromac but does nothing, Axer moves in, boosts the hit on the bird and boosts damage, finishing him. 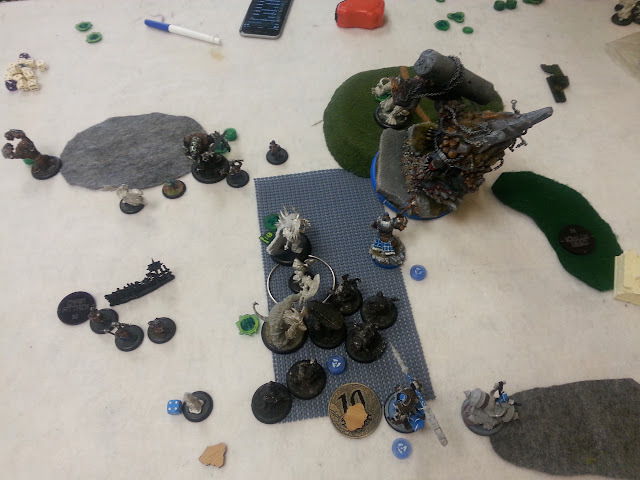 Mulg goes for Kromac, staying out of the Druid clouds, but cant dodge Primal howl. 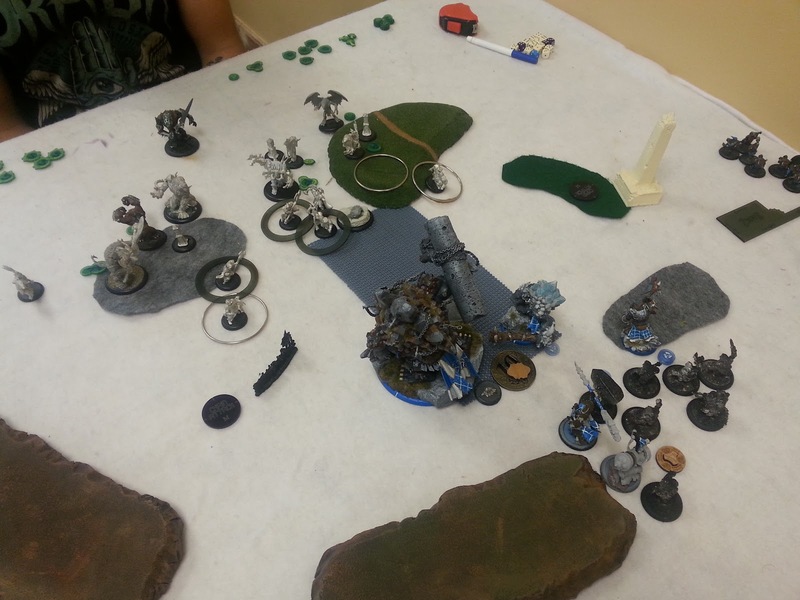 He hits Kromac2, but never gets the crit, and forces only one transfer. I killed the bird before attacking him, and he picked up a fury from that, so that was a mistake. I do score 3 CP though. 1 for objective, 2 for dominating. 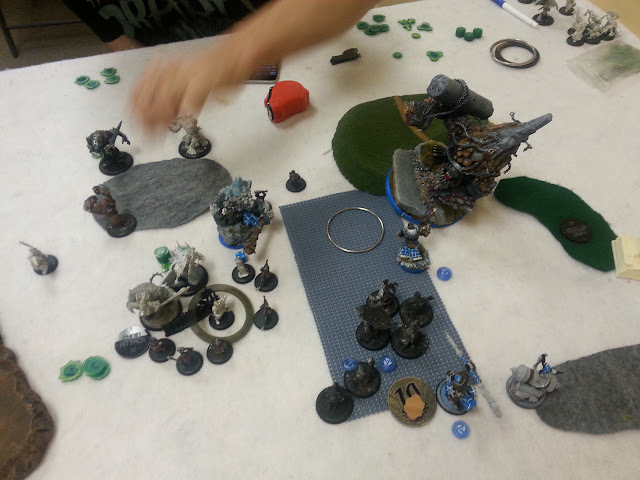 Gorax primals the Stalker, and the stalker goes all in on Mulg at ARM21. He leaves Mulg on exactly one box, and surrounded by whelps. Kromac2 Lightning strikes himself, kills all of the Whelps and contesting Burrower for free with heart eater, kills Mulg and sprints into the zone. Ghetorix moves over, clears out the burrowers around the last druid, and sprints into the zone too. The Pureblood runs to engage the king. Mulg was full on Fury, and so is the Axer and the King. I have to pull the fury off the King, which means that the Axer will probably frenzy, blocking a charge lane to Ghetorix. So now we have an issue. 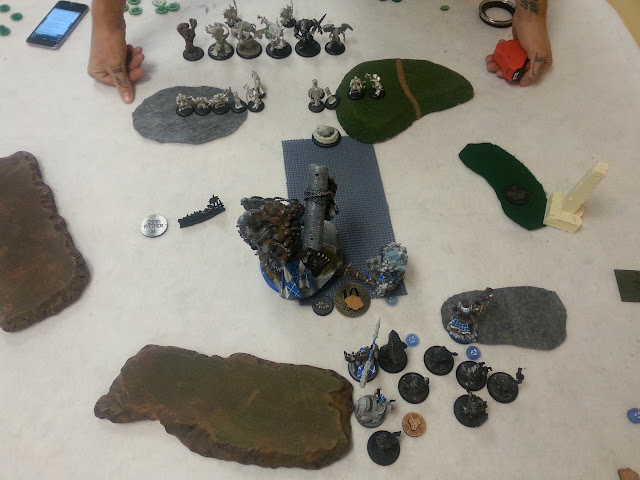 The Axer frenzies and does some damage to the Mountain King but not horrible. I don't think the King can kill Kromac on 3 transfers and needing even just 9s to hit. I don't think he got Primal howl in there. I certainly wasn't confident in it. But if I can remove Ghetorix, and the druid, Kromac doesn't contest. The other option to sprint to the flag and hope that I can tie him up but I have even less confidence in that. So my KSB activate, do +1 STR and shuffle around to hit the Druid and Ghetorix to no avail. Then Doomshaper3 charges Ghetorix, boosts the hit and gets the Crit Smite. I slam him 3'', but because it's a medium base slamming a large, I only slam him 1.5'', which barely leaves him in the zone, albeit KD, but still out of reach of the Mountain King. The damage does ok, but not much. So I amuck the King, and then blow the last 5 fury on Strangleholds. The first damages him, but the second boxcars on him. The effects don't stack, but at this point I'm nickel and diming him him to the point where I hope an assault/killshot will finish him. The leftover burrowers on the left walk over, and pickaxe him because I'm desperate, but even at dice -9, inflict four or five points on him. Then the guns. The first two don't do much, but the last one boxcars again and actually kills Ghetorix. At that point, the King walks in and sweeps the Druid, hits, kills, and that's game. I dominate for 5CP. 1. I don't like relying on the King to finish the game. Especially against things like Primal Howl or druid clouds. However, his ability to remove support from the game has been key several times and I really missed him in the game I played without him. 2. Should have upkept Admonition on Mulg. I still don't think he'd of survived but it would have been nice to make it a bit more difficult. 3. I need to be more careful with that first move. Sure I can run 16'', but if I had lost the King to Ghetorix turn 1, it'd of been a bad deal. Even at ARM23 (KSB and tier benefit), Ghetorix is hitting at dice even on feat. Granted, average dice and I think the King still survives since he doesn't get the second initial but it's still tight. Not something I want to bet on. 4. He did feat too early too. If it'd been later, like when he ran into the zone, there'd of been issues. Both of our feats seemed somewhat wasted but mine was definitely a timewalk. Just not much he can do against it. EDIT: 5. I wrote this late at night and forgot about one of the major points in the game. The biggest issue with D3 is that he doesn't speed his army up outside of Tier Turn 1, and being outthreated forces him to feat defensively. If he feats defensively, he loses the offensive power of the feat which is absolutely needed for med-high DEF models, E.G., any Circle beast with Primal Howl, or worse, Primal Howl and Druid clouds. 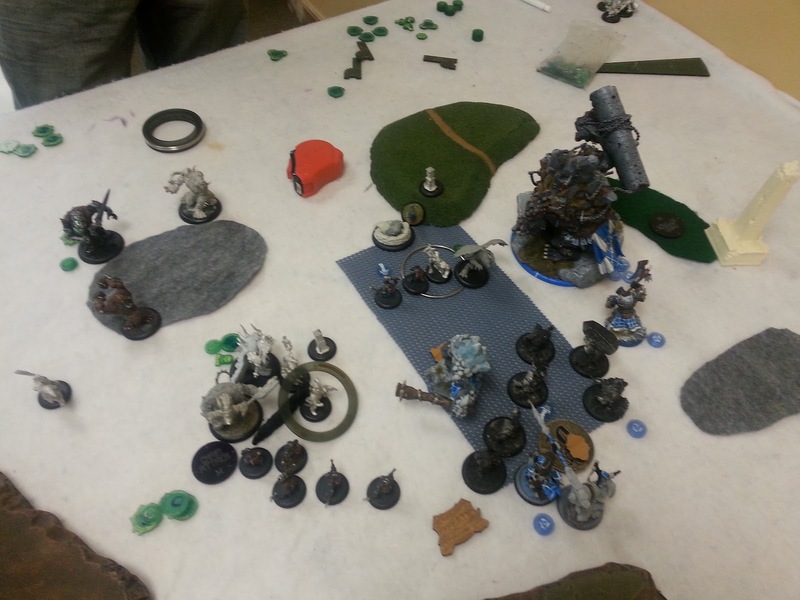 MAT3 Mulg is unhappy, and MAT1 Mountain King is nearly unusable. My opponent exploited this pretty well and just timewalked it, losing like, a druid and a stone to my feat. Pretty decent. After that I felt like I was on my back foot attrition wise. I was able to clear the zone and score the first three points which applied solid scenario pressure, but I was only just barely able to kill Ghetorix, and idk if the King would have killed Kromac. I don't think so. Granted, I would have tried the same crit smite from Doomshaper to knock Kromac down and my chances go way up, so it's there, but still. If I had failed there, it was game. Against a list that out threats me, I think I want to go second. Let them run, I get my positioning exactly how I want, but out of threat range even if it means everything is just basically walking. Next turn, I clear the zone, score first and score 3 pts, and now he can't clear me out of the zone on my turn during feat, meaning I can probably finish it and dominate for the last 2. That's the idea. Overall, fantastic game. Seemed pretty close to the end, but I don't know that either was favored as much. I don't like Blackclads handing out Hunter's Mark, and he played it very well leveraging his threat ranges. I think this game convinced him to pull the Pureblood for a Gnarlhorn just for Bounding and the Counterslam. Counterslam isn't particularly useful in this matchup but Bounding is brutal. Something I was glad he didn't have. Doomshaper3 has more options than meets the eye. This is the second game that Crit Smite from Doomshaper has been the key moment. He's mat5, but with Fury 7, he can try it like four times. When I need it, I need it, and he delivers so far. Hope you enjoyed the batrep. Kind of surprising to see 2 out so close to eachother, but this wasn't hard to write up. Pretty straightforward, low model count. Enjoy the holidays!